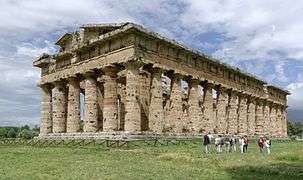 Between the 9th century BC and the 6th century BC, the ancient Greek temples developed from the small mudbrick structures into monumental double porticos buildings, often reaching more than 20 metres in height (not including the roof). Stylistically, they were governed by the regionally specific architectural orders. 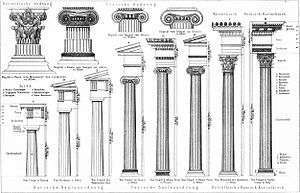 Originally, the distinction being initially between the Doric and Ionic orders, with the Corinthian order provided a third alternative in the late 3rd century BC. A multitude of different ground plans were developed, each of which could be combined with the superstructure in the different orders. 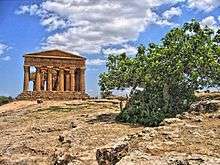 From the 3rd century BC onwards, the construction of large temples became less common; after a short 2nd century BC flourish, it ceased nearly entirely in the 1st century BC. Thereafter, only smaller structures were newly begun, older temples continued to be renovated or (if incomplete) completed. The determination and discussion of these basic principles went back to Hermogenes, whom Vitruvius credits with the invention of the eustylos. 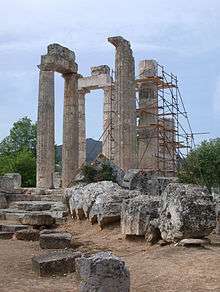 The Temple of Dionysos at Teos, normally ascribed to Hermogenes, does indeed have intercolumnia measuring 2 ⅙ of the lower column diameters. Only three basic colors were used: white, blue and red, occasionally also black. 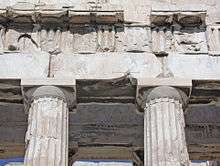 The crepidoma, columns and architrave were mostly white. 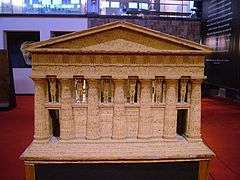 Only details, like the horizontally cut grooves at the bottom of Doric capitals (anuli), or decorative elements of Doric architraves (e.g. taenia and guttae) might be painted in different colours. The frieze was clearly structured by use of colours. 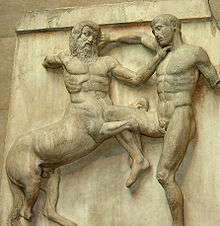 In a Doric triglyph frieze, blue triglyphs alternated with red metopes, the latter often serving as a background for individually painted sculptures. 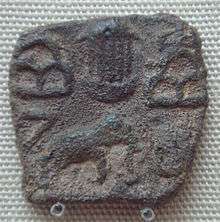 Reliefs, ornaments and pedimental sculptures were executed with a wider variety of colours and nuances. 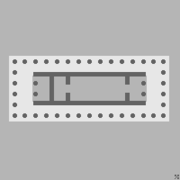 Recessed or otherwise shaded elements, like mutules or triglyph slits could be painted black. 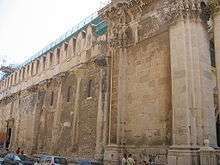 Paint was mostly applied to parts that were not load-bearing, whereas structural parts like columns or the horizontal elements of architrave and geison were left unpainted (if made of high quality limestone or marble) or covered with a white stucco. 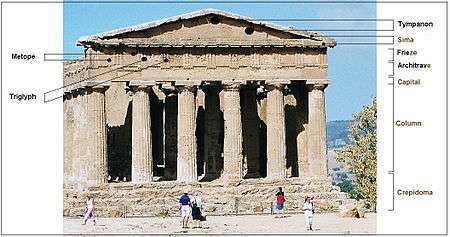 The increasing reduction of the number of columns along the long sides, clearly visible on Ionic temples, is mirrored in Doric constructions. 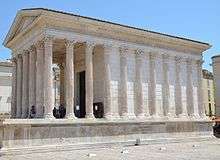 A small temple at Kournó has a peristasis of merely 6 x 7 columns, a stylobate of only 8 x 10 m and corners executed as pilasters towards the front. The peristasis of monumental Doric temples is merely hinted at here; the function as a simple canopy for the shrine of the cult statue is clear. 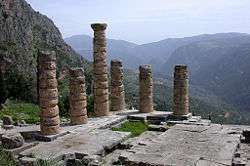 Roughly beginning with the erection of the older Artemision of Ephesos around 550 BC the quantity of archaeological remains of Ionic temples increases. The Artemision was planned as a dipteros, its architect Theodoros had been one of the builders of the Samian Heraion. With a substructure of 55 x 115 m, the Artemision outscaled all precedents. 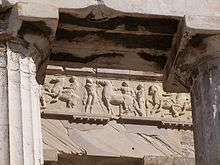 Its cella was executed as unroofed internal peristyle courtyard, the so-called sekos. The building was entirely of marble. 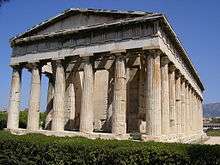 The temple was considered as one of the seven wonders of the ancient world, which may be justified, considering the efforts involved in its construction. 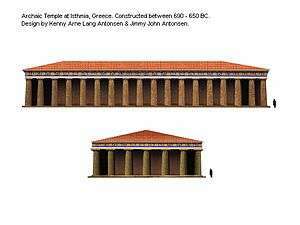 Ionic peripteroi were usually somewhat smaller and shorter in their dimensions than Doric ones. 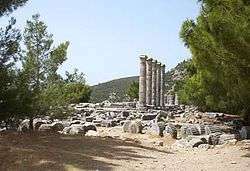 E.g., the temple of Zeus at Labraunda had only 6 × 8 columns, the temple of Aphrodite in Samothrace only 6 × 9. 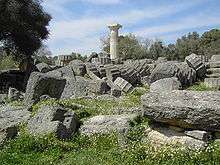 The temple of Athena Polias at Priene, already considered in antiquity as the classical example of an Ionic temple, has partially survived. 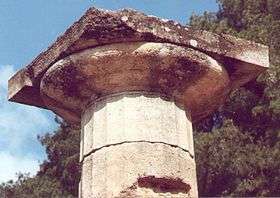 It was the first monumental peripteros of Ionia, erected between 350 and 330 BC by Pytheos. It is based on a 6-by-6-foot (1.8 m × 1.8 m) grid (the exact dimensions of its plinths). 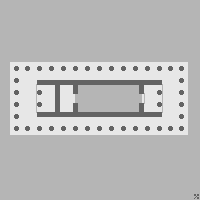 The temple had 6 × 11 columns, i.e. a proportion of 5:10 or 1:2 intercolumnia. 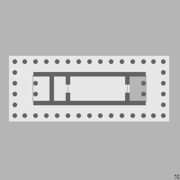 Walls and columns were aligned axially, according to Ionic tradition. 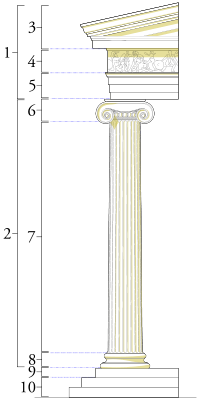 The peristasis was of equal depth on all sides, eliminating the usual emphasis on the front, an opisthodomos, integrated into the back of the cella, is the first proper example in Ionic architecture. The evident rational-mathematical aspect to the design suits Ionic Greek culture, with its strong tradition of natural philosophy. 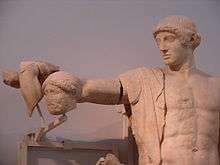 Pytheos was to be of major influence far beyond his lifetime. 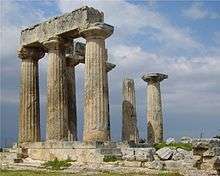 Hermogenes, who probably came from Priene, was a deserving successor and achieved the final flourish of Ionic architecture around 200 BC. ↑ Regarding Roman period and financing, using the province of Asia as an example, see Stefan Cramme: Die Bedeutung des Euergetismus für die Finanzierung städtischer Aufgaben in der Provinz Asia. Köln 2001. (Online Archived April 9, 2008, at the Wayback Machine.). ↑ Wolfram Hoepfner in: Wolfram Hoepfner & Ernst-Ludwig Schwandner (eds. 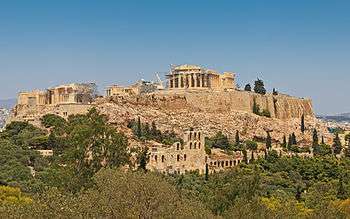 ): Hermogenes und die hochhellenistische Architektur. Internationales Kolloquium in Berlin vom 28. bis 29. Juli 1988 im Rahmen des XIII. Internationalen Kongresses für Klassische Archäologie. Mainz 1990. p. 12; Meral Ortac: Die hellenistischen und römischen Propyla in Kleinasien. 2001, p. 115 (Online Archived April 9, 2008, at the Wayback Machine.). ↑ Charles Picard – Pierre de La Coste-Messelière: Fouilles de Delphes. Bd. IV 3, 1931, S. 15 ff. 1 2 Dieter Mertens: Der alte Heratempel in Paestum und die archaische Baukunst in Unteritalien. 1993. ↑ Ibrahim Hakan Mert: Untersuchungen zur hellenistischen und kaiserzeitlichen Bauornamentik von Stratonikeia. Köln 1999, p 261-301 (Online Archived April 9, 2008, at the Wayback Machine.). 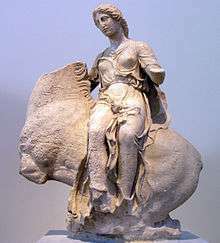 ↑ Hakan Mert: Untersuchungen zur hellenistischen und kaiserzeitlichen Bauornamentik von Stratonikeia. Köln 1999, p. 26 (Online Archived April 9, 2008, at the Wayback Machine.). ↑ Ibrahim Hakan Mert: Untersuchungen zur hellenistischen und kaiserzeitlichen Bauornamentik von Stratonikeia. Köln 1999, p. 26 (Online Archived April 9, 2008, at the Wayback Machine. ).